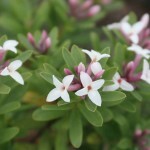 It produces an abundance of fragrant flowers, white blushed with pink in the spring. Intermittent blooms occur may occur throughout summer and fall. It requires excellent drainage, and prefers a moist, rich soil, in partial shade. Depending on the climate, it can be semi-evergreen to deciduous. Use as a small hedge, mass planting, or as a garden specimen.